The little bears are ready to play in the snow. But — oh, no! Their sled is too small! It’s not as much fun to go sledding only two at a time, but what can they use to carry them all? Luckily, Big Brown Bear has an idea — and it starts with a belly flop! 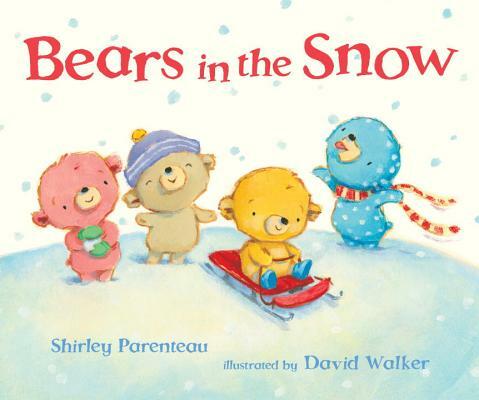 Shirley Parenteau is the author of five other books about the bears: Bears on Chairs, Bears in Beds, Bears in the Bath, Bears and a Birthday, and Bears in a Band. Shirley Parenteau lives in Elk Grove, California. David Walker has illustrated many children’s books, including the five previous bears books and the Peep and Ducky books by David Martin. David Walker lives in Chapel Hill, North Carolina. Walker's acrylic illustrations feature soft colors against simple backgrounds, playing up the action and the characters' emotions. Adults: get ready for your children to ask you to lie facedown in the snow at the top of a hill. The simple, rhyming text works beautifully with the engaging acrylic illustrations. A wonderful title to share as a seasonal storytime read-aloud or for beginning readers to discover on their own.